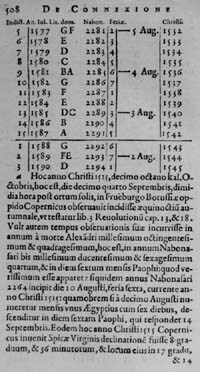 This page has a table establishing a connection among several calendars. Notice the reference to Copernicus in the text. The Fifth Council held at the Lateran Palace in Rome was summoned by Julius II (Pope: 1503-13) and continued by Leo X (1513-21), and lasted between 1512 and 1517. Paul of Middelburg presided over the commission to reform the calendar and sought advice from experts all over Europe, including Copernicus. 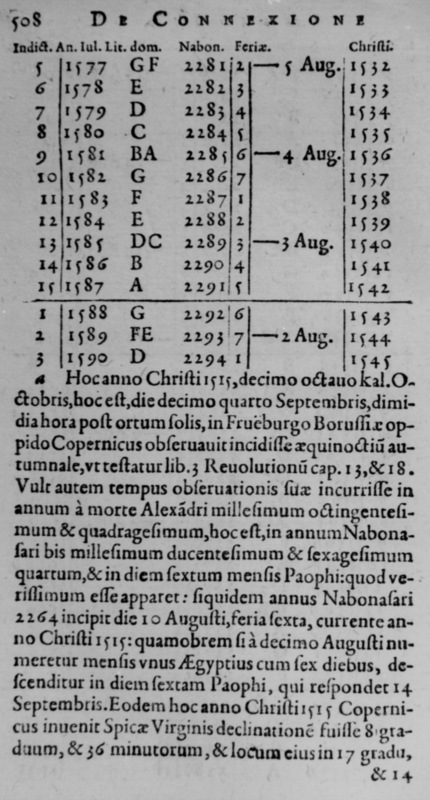 Copernicus wrote in a response, which is now lost, but probably stated something along the position stated in the preface to his Revolutions, that reform of the calendar was premature because the precise length of the tropical year was not yet known with sufficient accuracy.